Last year we had a series called “English Grammar 101,” where the basic grammar rules were covered. Many readers asked if it was possible to transform that series into an ebook. We thought that the idea was good indeed, and started working on it. Maeve edited the whole thing, adding examples and formating the sections. The ebook (in PDF format) is finally ready, with 34 pages of content. You can download it free of charge. Below you will find the content of the e-book and the subscription form to request your download link. In order to download the ebook you simply need to subscribe to DailyWritingTips email list. We only send out one email per week, on Tuesdays, and we only send useful content that will help you to improve your writing skills. Topics covered range from English grammar to punctuation and style. After subscribing your email address below you should receive the e-book download link within a couple of minutes. Here’s how our email containing the download link looks like. Obviously joining our email list is free and you can unsubscribe anytime you want. Thanks for sharing a link to this ebook. I’ve heard that it is fantastic. I’ll check it out. @Paul, thanks for the heads up, I will fix it asap. No problem. This is an awesome site, and I love the eBook. The daily blasts are excellent as well. Thanks for everything. @agustine, did you subscribed to our blog and received the first email? But you wrote it as, ‘@agustine, did you subscribed to our blog and received the first email? @Anil, it depends. If it is just a typo, like the one you mentioned, I don’t worry that much. I subscribed to download the ebook and get some writing tips, the download the ebook link in the email is dead. Correction, it is working now. FYI, here’s a list of errors I’ve noticed (in case you do a second edition :)): “subjet” on p. 5; missing period after item 2 on p. 9, first sentence under “Interrogative Pronoun” on p. 17, second and last items under “Adjective Classifications” on pp. 20 and 21, and “admirable” on p. 29; spaced en-dashes used instead of em-dashes throughout; quotation marks sometimes “” and sometimes “”, and missing after “Whom?” on p. 24; missing vertical space before NOTE on p. 13 and examples under “Imperative Mood” on p. 27; “The plural nouns data” on p. 14; “lining verb” (for “linking”) on p. 25; comma that shouldn’t be there on p. 26 (“active voice, becomes”); missing italics on p. 26 (“any form used with have when forming …”), p. 28 (examples in second paragraph under “Infinitive Mood”) and p. 33 (all three example sentences); “from” repeated on p. 34; missing space between initials in “F. J. Rahtz” on p. 34. PS: the typesetting is horrible. Oh, one more thing: the first example under “Subjunctive Mood” (p. 28) — “if I should see him, I will tell him” — feels odd to me. You can say either “if I see him, I will tell him” or “if I should see him, I would tell him” (with the former implying a higher likelihood of seeing him), but not the example. After I subscribed.I didn’t get “the basic english grammar ebook” as promised.What I got is the “Content Writing Case Study Report”.I hope you can give that ebook to my mail. I have subscribed but there is no link to the eBook in the email as mentioned. Could you please send the link or a copy of the book to my mail? Thanks in advance. I just wanna thank you for this wonderful material. Blessings! 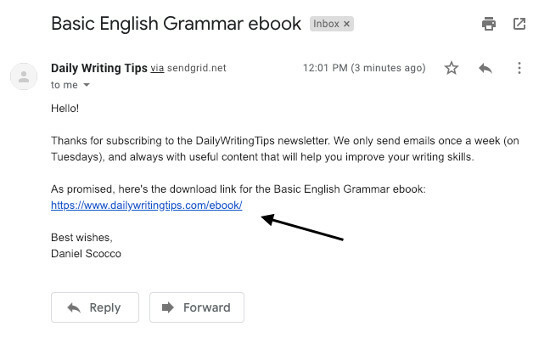 I subscribed then recieved the subscription email but could did not receive a link for the grammar e-book…hahaha I’m in dyer need of improving my english. I got the daily tips newsletter, but I never got the link to download the book! could you please fix me up? I’ve subscribed, but no email so far. Thank you very much for this great piece of content. I have subscribed to the dailywritingtips.com. unfortunately, I have not receive any reply or email. 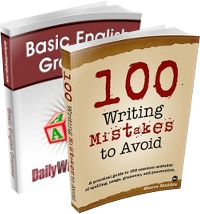 I would be very grateful indeed if you could kindly email me the free copy of “Basic English Grammar” daily writing tips. Thanking you in advance for your help and support. I would like to have that book because I thought on its good contents. 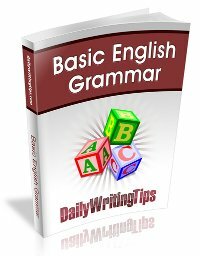 I would be very grateful indeed if you could kindly email me the free copy of “Basic English Grammar” daily writing tips. I have subscribed, but unfortunately have not received my free copy of this book. I liked your book, but however I miss testing myself on the concepts, as there are no exercises. I like to learn this book, because a lot of english exercises. can i download for this book? I haven´t received the e-book yet hope you send it ASAP. I have already waited for the 24 hours. Have i done anything wrong or it´s a regular thing? I’ve just subscribed and clicked the link in my confirmation email, however there was no link to the e-book. Could you please send it. Please send the link for ebook and don’t frustrate public and loose credibility so cheaply. I want to study English language.So, please send me this book. it is a basic grammar book.it is good grammar guide. 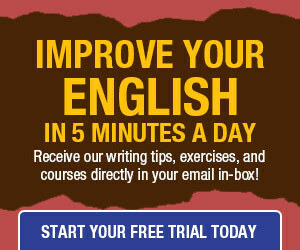 Thanks for sharing your eBook about English Grammar. Hi! I also didn’t get the ebook even though I subscribed. There was no lin priided in the confirmation email. Hello, I registered for the daily emails; however, I did not receive the e-book download.